I'm seeing an abundance of watermelon in the supermarket at the moment. It must be time to indulge in a bit of tequila and watermelon. How good does this look? Yum. In a blender, puree the watermelon until smooth. Set a fine-mesh strainer/sieve over a bowl and strain the watermelon juice, pressing gently on the solids to extract as much juice as possible. Discard the pulp. 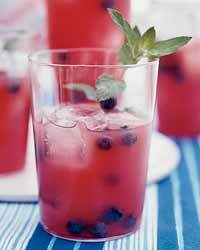 Fruity Gin Punch. So good you think you can drink it all day (you can't).